Officers waiting following a minor collision on 22nd and Valencia. 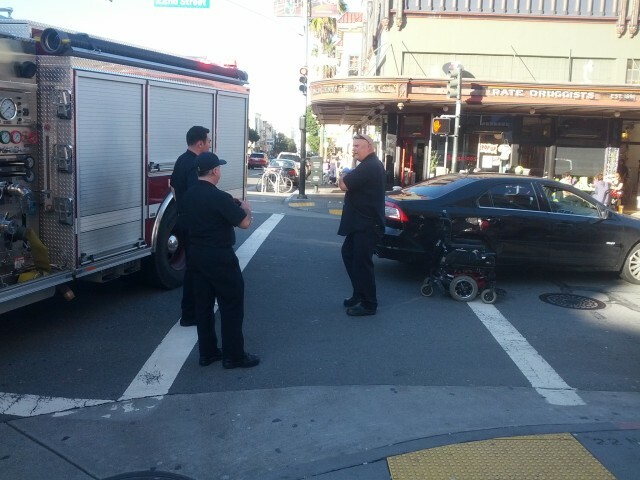 Around 2:30 Monday afternoon a man in a wheelchair crossing 22nd Street at Valencia was struck by a car turning east on 22nd Street. The man fell out of his chair after bumping into the turning car. Paramedics arrived shortly to transport the man to a nearby hospital. According to emergency response officers on-scene, the man’s injuries were minor and no one else was harmed from the incident. As of 2:40 p.m., officers had traffic blocked on 22nd Street waiting for someone to come get the motorized wheelchair that had been left behind.